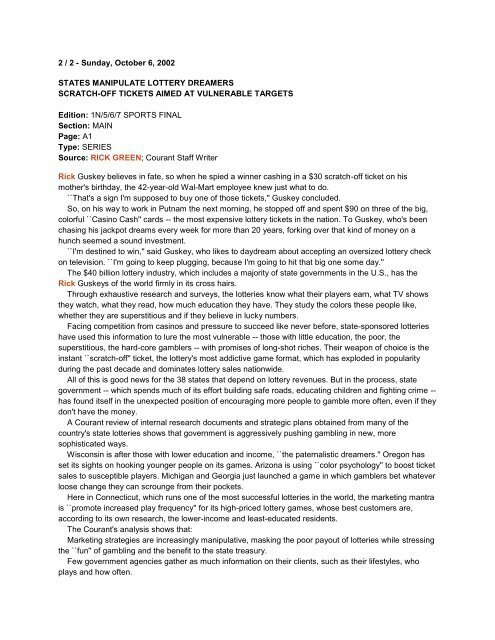 2 / 2 - Sunday, October 6, 2002 STATES MANIPULATE LOTTERY DREAMERS SCRATCH-OFF TICKETS AIMED AT VULNERABLE TARGETS Edition: 1N/5/6/7 SPORTS FINAL Section: MAIN Page: A1 Type: SERIES Source: RICK GREEN; Courant Staff Writer Rick Guskey believes in fate, so when he spied a winner cashing in a $30 scratch-off ticket on his mother's birthday, the 42-year-old Wal-Mart employee knew just what to do. ``That's a sign I'm supposed to buy one of those tickets,'' Guskey concluded. So, on his way to work in Putnam the next morning, he stopped off and spent $90 on three of the big, colorful ``Casino Cash'' cards -- the most expensive lottery tickets in the nation. To Guskey, who's been chasing his jackpot dreams every week for more than 20 years, forking over that kind of money on a hunch seemed a sound investment. ``I'm destined to win,'' said Guskey, who likes to daydream about accepting an oversized lottery check on television. ``I'm going to keep plugging, because I'm going to hit that big one some day.'' The $40 billion lottery industry, which includes a majority of state governments in the U.S., has the Rick Guskeys of the world firmly in its cross hairs. Through exhaustive research and surveys, the lotteries know what their players earn, what TV shows they watch, what they read, how much education they have. They study the colors these people like, whether they are superstitious and if they believe in lucky numbers. Facing competition from casinos and pressure to succeed like never before, state-sponsored lotteries have used this information to lure the most vulnerable -- those with little education, the poor, the superstitious, the hard-core gamblers -- with promises of long-shot riches. Their weapon of choice is the instant ``scratch-off'' ticket, the lottery's most addictive game format, which has exploded in popularity during the past decade and dominates lottery sales nationwide. All of this is good news for the 38 states that depend on lottery revenues. But in the process, state government -- which spends much of its effort building safe roads, educating children and fighting crime -- has found itself in the unexpected position of encouraging more people to gamble more often, even if they don't have the money. A Courant review of internal research documents and strategic plans obtained from many of the country's state lotteries shows that government is aggressively pushing gambling in new, more sophisticated ways. Wisconsin is after those with lower education and income, ``the paternalistic dreamers.'' Oregon has set its sights on hooking younger people on its games. Arizona is using ``color psychology'' to boost ticket sales to susceptible players. Michigan and Georgia just launched a game in which gamblers bet whatever loose change they can scrounge from their pockets. Here in Connecticut, which runs one of the most successful lotteries in the world, the marketing mantra is ``promote increased play frequency'' for its high-priced lottery games, whose best customers are, according to its own research, the lower-income and least-educated residents. The Courant's analysis shows that: Marketing strategies are increasingly manipulative, masking the poor payout of lotteries while stressing the ``fun'' of gambling and the benefit to the state treasury.  Few government agencies gather as much information on their clients, such as their lifestyles, who plays and how often.